250F The specification of this car promised no more than a competent successor to the 2-litre cars of 1952-3. But it was to become the one outstanding Grand Prix Maserati, serving four seasons in the front line and on intermittently through another three, thus covering the span of the 2.5-litre formula. In the hand of top-flight drivers it could challenge the more advanced cars run by much more generously-funded teams. It had considerable development potential, and especially in its later forms was a most handsome car. Colombo, who had undertaken development of the 2-litre cars, contributed to the design, with Bellentani and Alfieri. 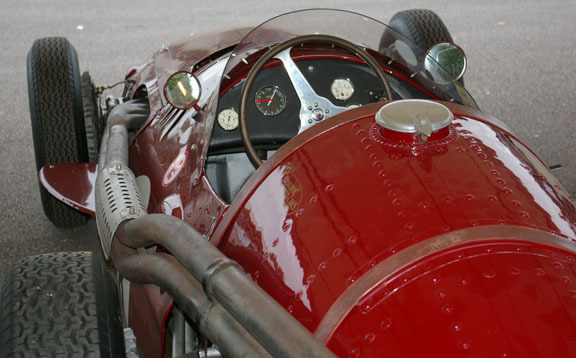 The definitive 250F - some A6GCMs were 'converted' with 250F engines as stand-in cars - emerged with a stiff multi­tubular chassis (not a space frame as such), wishbone and coil spring front suspension and a de Dion arrangement at the rear in place of the traditionally weak Maserati rigid axle, and a straight six (84 x 75mm, 1497cc) which gave 240bhp in 1954 and 270bhp in 1957. Throughout the car's 'production' life - 29 were built there were numerous changes and variants, quite apart from uprating, including lightweight cars, short-wheelbase 'Piccolo' cars, V-12-engined cars and the Tec-Mec. Along the way the standard bodies became slimmer, a streamlined car was tried in 1955, offset cockpits were introduced. Among independent cars, the 250Fs run by Moss and the Owen Organization had notable modifications, both having disc brakes and Moss' being tried with fuel injection. A works V-12 car also appeared in the 1957 Race of Two Worlds at Monza with a 3.5-litre engine, and the 4.2-litre Maserati Eldorado Special run in that event in 1958 used some 250F components. Almost every driver of the 1950s seems to have raced a 250F and the car was a mainstay of independent teams and entrants. A 250F won the first race in which it was run, driven by Fangio in Argentina in 1954, and the great man won his fifth world title when he drove 250Fs in 1957. More than 40 races fell to 250Fs, including eight Championship events (in modern terms that might not sound impressive, but in 1954-7 there were only 28 such races). A 250F ran in the first race of the 2.5 litre formula, and in the last. It was also successful in southern hemisphere formuJe libre racing. 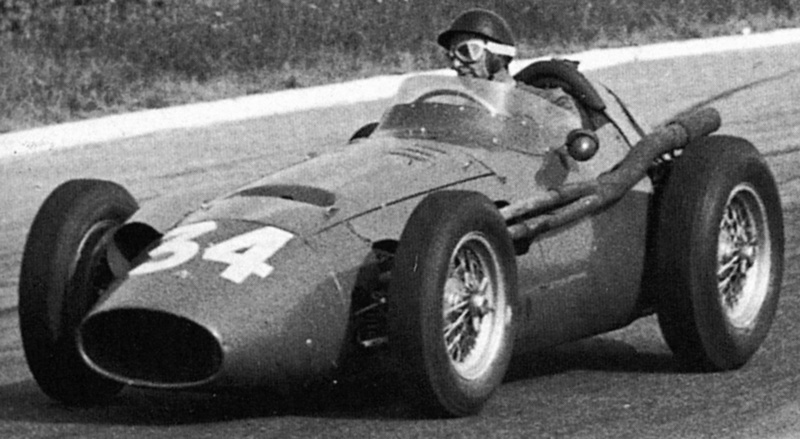 As far as a works team was concerned, the Maserati racing department closed at the end of 1957, but work was still undertaken for private owners and two Piccolo 250Fs were completed, one to be driven by Fangio in his last Grand Prix. Drivers : Chris Amon, Alberto Ascari, Jean Behra, Carel Giodin de Beaufort, 'B. Bira',Jo Bonnier, Jack Brabham, Keith Champbell, Euore Chimeri, Louis Chiron, Johnny Claes, Peter Collins, Antonio Creus, Colin Davis, Bob Drake, Jack Fairman, Juan-Manuel Fangio, Maria Theresa de Filippis, John Fitch, Bob Gerard, Gerino Gerini, Francesco Godia-Sales, Froilan Gonzalez, Horace Gould, Emmanuel de Graffenried, Masten Jregory, Pablo GuIle, Bruce Halford, Mike Hawthorn, Hans Herrman, Ken Kavanagh, Jean Lucas, Lance Macklin, Umberto Maglioli, Sergio Mantovani, Onofre Marimon, Luigi Musso, Cesare Perdisa, Luigi Piotti, Louis Rosier, Jim Russel, Roy Salvadori, Giorgio Scarlatti, Harry Schell, Carroll Shelby, Andre Simon, Bob Stilwell, Piero Taruffi, Andre Testut, Alessandro de Tomaso, Luigi Villoresi, Ottorino Volonterio, Peter Walker, Ken Wharton. Fangio on his way to victory in the 1954 Belgian Grand Prix in one of the original 250Fs. It seems to have as many louvres as the 4CLT/48.